For the sake of all involved in the Kacheek Flour lending process please read this article in full. KFlours are expensive items and handling them should never be taken lightly. There are two kinds of flour battledome items currently on Neopets, and they both do the same basic thing: change a pet's species. 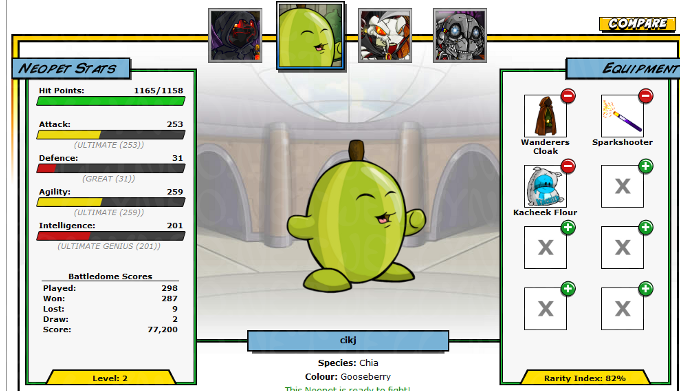 While turning your pet into a Chia with the retired Chia Flour is worthless, battlers often lend Kacheek Flour due to the full healing ability of the Kacheek Life Potion. The life potion is a full healer when your pet is above 33% of max health, making it the cheapest full healer on Neopets right now. 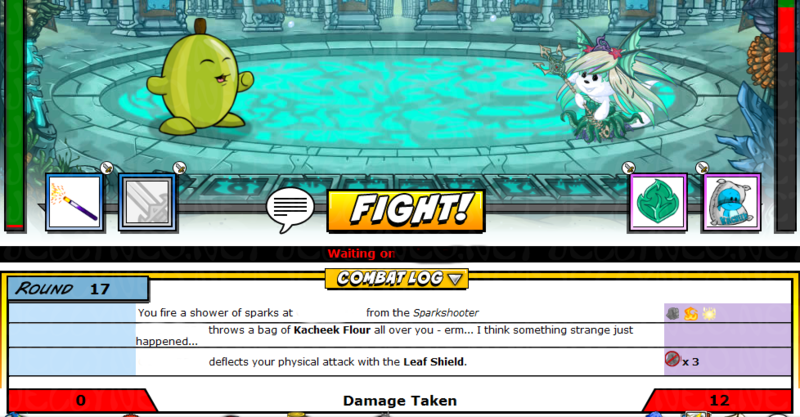 While for a lot of battlers who train having a Kacheek as your main battle pet all the time is easy enough if you use the lab ray for training (or even just to get HP while Negging an already trained pet) it is handy to have a quick way to change back in times of plots. Given the cost of a morphing potion, this flour helps. The problem arises in the fact that the flour is a fragile item which may break if simply USED. While stealing the flour used to be no big deal in the past, ever since the advent of random stealing additional points must be made to help avoid catastrophe. The basic idea is that you equip the flour (and other items as explained below), do not use it, and have it stolen so the lender can use the flour on you. The thing is, when someone uses a stolen 1-use or fragile item then the item goes back to the user after the battle regardless of whether or not it breaks. After you're finished, simply unequip the flour and send it back to the lender. Often the hardest part of getting a KFlour lend is finding a lender. Remember you are the one who needs help here, so show them the utmost respect while conversing with a perspective lender. Often some of the bigger battledome guilds have a guild KFlour lender (or more then one) so if you are in a guild that should be your first stop. Occasionally you can find a lender on the battledome board, but if you make a posting about this, remember to be patient and kind. No one wants to have their flour bugged out of them. When you do find a lender chances are they will ask for collateral. It is very rare to find a lender who is willing to lend without this as it is a big risk. Not only is there the risk of random events in transit, but also the very real risk of screwing up and accidentally using (and breaking) the KFlour. Generally the only time you will find a collateral-free trade is if you personally have known the person for years and are very close friends. Even then, do not instantly assume they will not ask for collateral. Unlike the Super Attack Pea whose collateral few people can afford fully, the flour collateral is normally very reasonable and often based on market price. Sometimes you will find users who will accept part collateral on this, but once more don't expect it. Lenders will generally ask for ETS items, as items which are basically unsellable are of little use to someone who may need to quickly replace the lost flour. If you offer a single item worth a ton more then the flour the lender may still reject due to the risk of that item being stolen via random event, or the inability to easily sell it. Small weapons as collateral is often safer, but it is purely up to the lender what they wish to do. Importantly, you are not allowed to offer any sort of payment or "tip" to the lender, even in exchange for lowering the collateral. This is against TNT rules and risks getting you and the lender frozen. So now you have gotten yourself a lender it is time to visit the trading post. While it may seem easier to simply send the items it is much safer to use the trading post as a medium. The lender will put up a trade with the flour and you will offer the collateral. When the flour is returned this process is reversed. This is so that you can be sure you are getting back all your collateral and they can be sure the flour is coming back too. Before the trade you may wish to fill up your inventory with items or attractors to minimize the ability for a random event to ruin the day. As mentioned above the changes to stealing mean a dramatic change to the process of Flouring a pet. While once you could simply have placed the flour in the right slot and had it easily stolen, now the random element means it may be impossible to steal the flour. If you are left holding nothing but the KFlour and you have to use an item during your turn, do not use it. Withdraw from the battle. I cannot urge this enough, if all you have left is the flour, do not use it. Now that we have that out of the way, hopefully the lender will be using a Purple Sticky Hand rather then the normally more useful Heavy Robe of Thievery so that you can simply keep passing the stealer back and forth until the right item is stolen. This in mind, you as the borrower should have THREE items equipped. The KFlour (naturally), a shield, and a weapon that won't kill the opponent. All this hassle is due to the fact you must use at least one item during your turn. If you only have the KFlour equipped, end the battle. Do not use the flour. Otherwise, use the shield and hope that the flour is stolen. If one of your weapons is stolen, at least then you have the other weapon (and hopefully the Sticky Hand!) to attack with instead of the flour. Keep repeating this until the flour is in the right hands. Once the lender has the flour, keep the battle going until the flour does its magic. If you still have your defending item equipped after the stealing folly then use it, otherwise use the weak attacker. Avoid using the Sticky Hand as you may accidentally steal back the flour! When this process is complete take the Flour off of your pet and return it to the lender for your collateral back, as with all lends. Remember this whole process will take some time and often upwards of 20-30 turns to complete. Your pet should now be a Kacheek and able to use the Life Potion. 1. A borrower should never use the KFlour. If you are about to be forced to, Withdraw. 2. The Lender is the person who is in charge here, always listen to their instructions and never assume you know best. Remember you are battling the lender here, they will have the Kacheek. 3. If you lose the flour, you lose your collateral. Simple as that. Lenders need to replace them quickly (especially if they are guild lenders) and this can be an expensive task. 4. Despite the other points here, do not stress. Be calm, cool, and just do what needs to be done. If you are afraid of random events simply fill your inventory with items or Pant Devil Attractors. 5. Check that you really need a flour before asking; if you only have a 50hp pet you could easily get by with something lower tier, like a Greater Healing Scroll. 6. If you have a pet such as a Grarrl or Skeith be sure it is well fed to remove the risk of it eating the flour. Perhaps even putting it in the Neolodge. Finding a KFlour lender and gathering up the collateral can be hard work, but with access to a full healer during a plot it is often worth the upgrade. Just be careful, listen to instructions and you will hopefully have a pleasant lend. Major shout-out to my friend and overall nice user labmom for suggesting this guide and for her input.